How to Care for Your Favourite Antique Furniture? Whether it holds significant historical or artistic value, or is simply a treasured family heirloom, antique furniture requires a different type of care than ordinary modern pieces. Weekly cleaning: Dust with a soft cloth. Avoid feather dusters, which can scratch the finish. Snip any loose threads that could catch on pieces of veneer or marquetry before dusting. Rather than using spray polish, which can build up on the surface of the furniture, slightly dampen the cloth with water – it should be nearly dry – then dust. Seasonal inspection: Check the furniture for loose pieces or joints and signs of pest infestation. Droppings, sawdust, and holes are all clues that something is living in the wood or upholstery of your antique furniture. If you find signs of infestation, call an experienced antique furniture restorer immediately. Do not try to deal with the infestation yourself; insect sprays can damage your furniture. Don’t throw your old furniture away! Instead, treat it the best way! 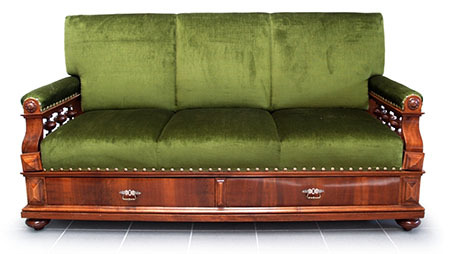 A little forethought can prevent most of the damage common to antique furniture. Place the piece in an area that does not receive direct sunlight. UV rays can cause yellowing. Avoid locations near heating and air conditioning vents or fireplaces. Changes in heat and humidity cause the wood to expand and contract, loosening joints and causing warping. Maintain a constant humidity level in your home. If you live in an area that has extremes of dryness or humidity, install a humidifier or dehumidifier in the room containing your antique furniture – or consider a whole-house unit. Do not place a humidifier close enough to the furniture that condensation could collect on the wood. Wipe up spills immediately, before the liquid has time to penetrate the wood. Use coasters to further protect the wood. If your antique furniture is important to you, it’s worth taking it to a professional for any needed repairs or restoration. The products and techniques that are designed for modern pieces may lower the value of an antique. If a piece of wood or veneer breaks off, do not throw it away. Save it for the restoration team. Depending on the specific piece of furniture, replacement materials may be difficult or impossible to obtain, and using the original wood or veneer may protect some of the furniture’s value.